The science Remotely Operated Vehicle (ROV) named Isis is a work-class vehicle capable of descending to a depth of 6500m. The vehicle is supported with containerised control room, workshop and spares storage, with a Launch and Recovery System (LARS). Suitably sized and dynamically positioned (DP) ships of opportunity allow the system to be freighted and operated around the world. Find out more about the ROV Isis. Read about the recent trials cruise of the newly rebuilt Isis and find out more about the Isis team on that cruise. 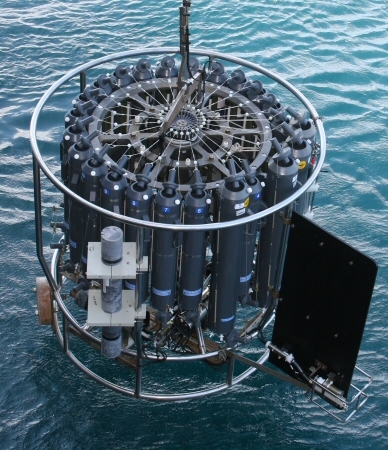 A large instrument package called a CTD is the standard workhorse of oceanographers for acquiring water column profiles. It is called a CTD because as a minimum it measures electrical Conductivity, Temperature, and Depth (pressure). The conductivity measurement can be corrected with temperature to give salinity or how salty the seawater is. With just these three measurements, a good picture can be gained of the physics of the ocean along a section.